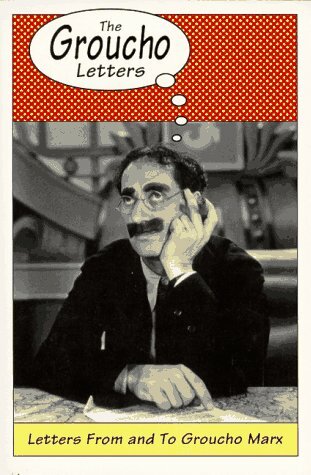 The Groucho Letters: Letters from and to Groucho Marx was featured recently in one of the four million e-mail newsletters I receive. I think it was Very Short List. I'm so behind on personal e-mail right now it's silly. You claim to own Casablanca and that no one else can use that name without your permission. What about "Warner Brothers?" Do you own that, too? You probably have the right to use the name Warner, but what about Brothers? Professionally, we were brothers long before you were. We were touring the sticks as The Marx Brothers when Vitaphone was still a gleam in the inventor's eye, and even before us there had been other brothers--the Smith Brothers; the Brothers Karamazov; Dan Brothers, an outfielder with Detroit; and "Brother, Can You Spare a Dime?" (This was originally "Brothers, Can You Spare a Dime?" but this was spreading a dime pretty thin, so they threw out one brother gave all the money to the other one and whittled it down to, "Brother, Can You Spare a Dime?"